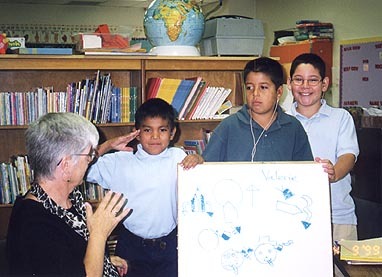 Teacher Cecilia Flood with Deaf students in Albuquerque, New Mexico. Improving literacy levels of the born-deaf. 1. Requested by Teachers.... Our literacy materials are sorely needed. Educators have suggested and requested them. 2. Why Is It Needed?.. Not all born-deaf children learn to read and write well. Many schools graduate born-deaf children with little or no English skills. Why is this? One reason is that the born-deaf's first native language is not English, but Sign Language. Learning to read and write your second language before learning to read and write your first language is very difficult. Before SignWriting was invented, there was no solution. SignWriting makes it possible for deaf children to read and write Sign Language and English side by side. For many deaf children, SignWriting is the bridge to literacy. The purpose of the Literacy Project is to test this in the schools and to then disseminate the documentation to other educators for review. Documentation already received has been outstanding and the results are quite successful. Kids who could not read before are reading in ways that people would never have dreamed. 3. Target Population... The age of the students varies depending on the school.Our focus is K-12. However, Deaf people of all ages can use our materials, and some Deaf adults have greatly benefited from our materials too. We have created a special web page for each school, to document the student's progress, and to provide information for parents and teachers. Software & the World Wide Web: 1000's of people receive free software, free lessons online, and free documented feedback posted on our popular SignWriting Web Site, which receives 10,000 to 20,000 hits daily. Donated Materials: 100 deaf children in 1999 plus several groups of Deaf adults, are receiving donated books, videos and software. Their parents and teachers benefit from our donated materials too. This includes two residential schools for the Deaf, four mainstreaming hearing impaired programs at elementary schools, and one private-tutor with 7 deaf children. The schools are all over the USA, but our Deaf staff members, who give them technical support, are from Southern California. SignWriting Email List: 150 members in 1999 include teachers, administrators and researchers. Issues surrounding literacy for the deaf are discussed. This service is provided free by our non-profit organization, and is helping educators learn of new developments in teaching deaf children. Deaf staff members help prepare the materials for the project. 6. No Duplication...No other agency is duplicating our services, since this is a new way to teach the deaf. No funding is received from the United Way. 7. Contact Person...Valerie Sutton, inventor of SignWriting, and President and Executive Director: (858)456-0098 voice. The National Association of Police and Lay Charities, a 501c3 non-profit organization, helps children feel safer, by providing teddy bears and other services, while the police are taking care of the children. Dubbed as the "TeddyBear Cops", the NAPLC receives funding from vehicle donations. In 2004, your donation of a car, auto, vehicle, truck, van, motorcycle or boat will help deaf children too! So please donate your vehicle to the Police and Lay Charities. The proceeds will help fund our SignWriting Literacy Project for Deaf Children. THANK YOU!